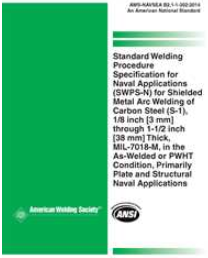 If you have worked with the American Welding Society codes, you have probably heard about Standard Welding Procedures Specifications (SWPSs). A SWPS is define by AWS as a welding procedure specification qualified according to the requirements of AWS B2.1/B2.1M, approved by AWS, and made available for production welding by companies or individuals other than those performing the qualified test. Essentially, a SWPS is a welding procedure that has been qualified by testing and has a proven track record of assuring quality. It is approved by the Welding Research Counsel. All SWPS have not just one, but may Procedure Qualification Records (PQRs) that have proven the procedure time and time again. SWPSs can be purchased from AWS. A SWPS is similar to a prequalified WPS in that a fabricator can obtain it and use it without having to qualify it by testing, unless otherwise stated in the contract documents. The main difference is that a fabricator can purchase a SWPS from the AWS and they are good to go. A prequalified WPS still needs to be developed by the fabricator, meaning they have to determine all of the essential variables. For fabricators that lack proficiency in welding a SWPS is better than trying to use prequalified WPSs. If the fabricator has experience in welding and is comfortable developing and writing welding procedures, then taking advantage of prequalified WPSs will save them money. A SWPS will cost you between $200 and $270 depending on whether you are an AWS member or not. A prequalified WPS is developed in-house with minimal cost. Other than saving you money the use of prequalified welding procedures has many advantages. So, what do you get if you purchase a SWPS from AWS? Unfortunately, unless you have seen one before, you don’t know what you are getting since AWS does not publish samples. There are three main sections. You do not get a filled out WPS form, you get instructions on allowed values for each of the variables in the WPS. The three sections are the following. Requirements for the application of SWPSs – this section basically says that you are responsible for the proper use of the procedure. It is important to note that the fabricator choosing to use a SWPS still has all the liability associated with the end product. For the SWPS to be valid, the fabricator signifies acceptance of responsibility for the production application of the procedure by signing and dating the SWPS. When should you use a SWPS and when should you use a prequalified WPS? Put simply, if you don’t understand how welding variables affect the weld and have little to no experience developing procedures then buy the SPWS. If you are experienced in developing procedures, then take advantage of using prequalified welding procedures when allowed. Please let me know as to how I could start using the SWPS. Richard, SWPSs are allowed by several codes including AWS D1.1, D1.2, D1.6 and in some cases ASME BPVC. You must first look at the contract documents (referencing documents) to see which code you must follow. Then check the exact requirements of the code. In the case of D1.1 you are allowed the use of prequalified welding procedures. Anytime prequalified WPSs are allowed you can use a SWPS. In cases such as AWS D1.2 (Aluminum Structural Welding Code) prequalified WPSs are not permitted, everything must be qualified by testing except when the engineer in charge approves the use of previously qualified WPSs, which would include SWPS. What code are you following? Are you building a structure for a customer? If so, what do the contract documents say regarding qualification of welding procedures?